Many causes espoused by the Christian Right seem righteous and Biblical. One can hardly find fault with objectives such as producing "men of integrity," a return to "family values," protecting the "right to life," and other worthy causes promoted by the many politically active Christian organizations. However, it is imperative that Christians look beyond the endearing slogans and outward appearances of religious organizations in order to evaluate their true agenda. (John 7:24) Many, if not most, of the Religious Right organizations have been created to control and neutralize conservative Christians who oppose the globalist agenda for a New World Order. Prior to Hitler's election as Chancellor of Germany, many Protestant ministers were naively impressed with Hitler's conservative rhetoric and encouraged German Christians to support National Socialism. 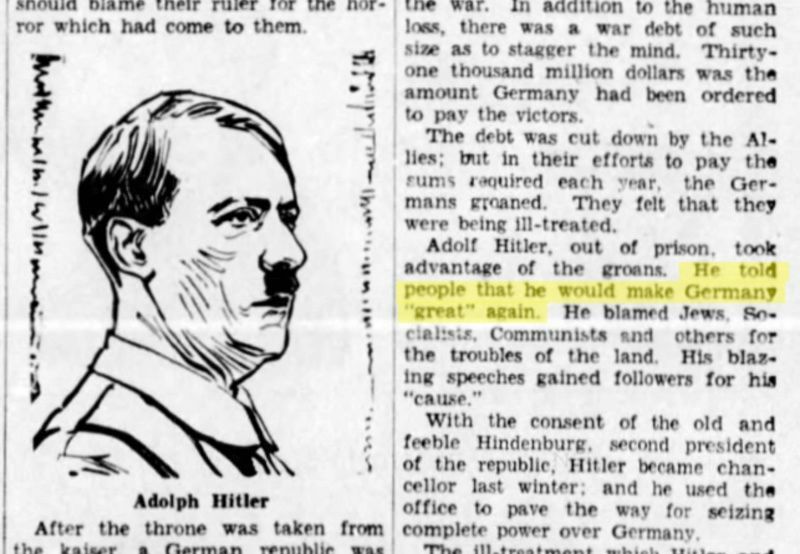 Der Führer's promise to the people was to "make Germany great again." In The Rise and Fall of the Third Reich, William Shirer wrote the following account of one influential minister who failed to recognize early enough that Hitler used Christian terminology only as an artifice to enlist the Protestant leadership in his service. "The Reverend Martin Niemoller had personally welcomed the coming to power of the Nazis in 1933. In that year his autobiography, From U-Boat to Pulpit, had been published. The story of how this submarine commander in the First World War had become a prominent Protestant pastor was singled out for special praise in the Nazi press and became a best seller. To Pastor Niemoller, as to many a Protestant clergyman, the fourteen years of the Republic had been, as he said, 'years of darkness' and at the close of his autobiography he added a note of satisfaction that Nazi revolution had finally triumphed and that it had brought about the "national revival" for which he himself had fought so long -- for a time in the free corps, from which so many Nazi leaders had come. "He was soon to experience a terrible disillusionment. "The Protestants in Germany, as in the United States, were a divided faith. Only a few -- some 150,000 out of forty-five million of them -- belonged to the various Free Churches such as the Baptists and Methodists. The rest belonged to twenty-eight Lutheran and Reformed Churches of which the largest was the Church of the Old Prussian Union, with eighteen million members. The following article documents the origins and development of the Religious Right in the United States via similar exploitation of the Christian Church by the Rockefellers and other globalists. The article was written by Chey Simonton who with other researchers investigated the Rockefeller connections to Conservative political causes such as the Charter Schools Initiative in Washington State in 1995/96. They discovered that this initiative was being promoted by political Leftists and Christian Right organizations alike and that the latter were fronts for Liberal Socialist planners. Paul Weyrich, whose connections with Rockefeller and Big Business are documented herein, orchestrated the mobilization of the present Religious Right political movement. Weyrich has long been a member of the Council for National Policy, whose membership includes many prominent Evangelical leaders who formulate policies for the Christian Right in collaboration with leaders of secret societies, subversive organizations, New Age cults, former and neo-Nazis, and globalist political and corporate power brokers. The origins of the CNP in the John Birch Society and Council on Foreign Relations are documented in our reports on The John Birch Society and The Council for National Policy. Detailed information about prominent CNP members, which reveals their anti-Christian, anti-American connections is provided in our Database of CNP Officers & VIP Profiles. * William Shirer, The Rise and Fall of the Third Reich, Ballantine Books, 1950, pp. 325-6, 329-31. To understand why various "Conservative/Christian" organizations in Washington State as well as every other state in the nation have been less than stunning in their battle for Parents Rights and Family Values in public education, it is necessary to examine the financial contributions or "scientific giving" and patronage of the Rockefeller family, through their family members, various businesses and foundations to social causes over the past century. Bearing in mind that, "He who pays the piper calls the tune," a single-minded piper with very deep pockets can control ALL the tunes, regardless of which band is playing. We'll start with history from a century ago. One of the early philanthropies of the Rockefellers was the 1903 creation and funding of the General Education Board that focused on controlling education of minority populations in the rural south. During these early days of involvement they also founded and funded Columbia Teachers College in New York City to train teachers in the new science of behavioral psychology pioneered by Wundt in Leipzig and John B. Watson here in the U.S. The Rockefeller children had their personal education supervised by the well-known humanist/socialist progressive educator, John Dewey. After the successful Bolshevik Revolution of 1917 Dewey spent considerable time in the newly created USSR and helped the brand new commissars devise their school system. In 1921 the Council on Foreign Relations was founded by the global-minded Rockefellers and other like-minded individuals. There has been a cloud of controversy surrounding the CFR since it's inception. Great personal wealth and a drive for power in all spheres of society and business have been the hallmark of it's membership from the beginning. If there is an "Elite" in our representative republic, the membership of the CFR represents the "Elite", if only to themselves. The list of media moguls, appointed and elected national politicians, military leaders, etc. goes on for pages and pages. ". . .who would shape American policy in the postwar era, the best and brightest of their time and place, but who, outside their own elite world, were virtually anonymous." 1. In the mid-1920s the Rockefeller's General Board of Education evolved into the International Bureau of Education and formed a partnership with UNESCO (the United Nations Education Scientific and Cultural Organization) when it was formed shortly after World War II. The Rockefellers so strongly supported creation of the United Nations that they specially purchased then donated the New York City real estate where the towering UN is located. In 1948 the Rockefeller Foundation made a four year grant to Harvard University Department of Economics to develop a mathematically-based method for a totally predictable Planned Economy through social engineering techniques. This program was called Silent Weapons for Quiet Wars technology. It involves intensive control and manipulation of the masses through media, markets, advertising, labor and wages, and public education. 2. "The substance of the directives under which we operate is that we shall use our grant-making power to alter life in the United States so that we can be comfortably merged with the Soviet Union." The Rockefeller Foundations' activities were found to line up exactly with Gaither's admissions and are well-documented in Congressman Reece's hearings and can be ordered from the Superintendent of Documents in Washington D.C. The entire text of this series of these hearings is voluminous and contains thousands of pages. It is also available on microfilm at the University of Washington library. In mid-1960s the Rockefeller-funded International Bureau of Education and UNESCO discovered an ideal education vehicle for their Silent Weapon model developed by the Harvard Department of Economics. This is the Lifelong Learning model, that as Educational Restructuring, we are experiencing today. Over the next decade the IBE UNESCO partnership published many books expounding and refining every facet of the Lifelong Learning model. Many of these books serve as evidence in the video "The People vs. the Educational Confederacy, Educational Restructuring on Trial". These publications are on the shelves at the University of Washington library. Culturally, we look back to the 1950s, and early 1960s when the majority of Americans, many veterans of WWII and Korea, were traditional nuclear families and carried out their daily lives with minimal interest in the political life of the nation or the world, catching the nightly news and reading the newspapers to keep current, but not intensely involved. This great majority of the population was dubbed the Silent Majority. A Silent Majority of sensible, responsible people who believe in the integrity of their elected officials and system of government is not conducive to "moving the United States towards a merger with the Soviet Union." Such a merger requires intense emotional and financial upheaval of vast populations, here in America and in the Soviet Union, as well. In order to have a social revolution and manipulate an entire people into a new social order, it is necessary to incite them to the point of activism due to heightened perceptions of threatening issues. Nuclear holocaust, ecology, feminism, gay rights, abortion, euthanasia, drugs and crime are issues that have become headlines during this process of fomenting revolution. This manipulation is basic to Marx's Dialectical Materialism where opposing forces are pitted against each other relentlessly until the crisis point where, to avert cataclysm, a preconceived but carefully obscured compromise is enacted and the desired "synthesis" has been achieved, in this case, the Planned Economy and different social order, on a global scale. One successful tactic has been to change the public perception of the Republican party. Republicans, always considered the party of Big Business interests, have supposedly become morally "traditional", appearing to trumpet and champion issues close to the hearts of the Silent Majority. The demographics of the Silent Majority had been carefully mapped using the sociological component of the Rockefeller financed Silent Weapons developed by the Harvard Dept. of Economics in the early 1950s. Under intense manipulation, the Silent Majority could remain silent no longer. Successful recruitment and control of a large and emotionally volatile group requires careful rhetoric and skill. It also requires strong central organization, leadership that is perceived as "moral", and lots and lots of money. There emerged one man who has been extremely successful over the past 20 years, quietly channeling the activities and loyalties of New Right activists in directions compatible with the desires of his money masters. Paul Weyrich, a Wisconsin born "conservative" first founded the Washington D.C. based think tank, Heritage Foundation, and served as it's president for a number of years. In William Greider's bestseller, WHO WILL TELL THE PEOPLE: THE BETRAYAL OF AMERICAN DEMOCRACY 3. reveals , "Not withstanding its role as 'populist' spokesman, Weyrich's organization, for instance, has received grants from Amoco, General Motors, Chase Manhattan Bank and right-wing foundations like Olin and Bradley." Remember, he who pays the piper calls the tune. If whoever funds your paycheck is your "boss", Weyrich is paid by multinational business to promote a multinational business agenda. It takes a heck of a stretch to maintain a pious pro-family demeanor with financial backing from these sources. Ivy Lee, the public relations genius guiding the Rockefeller image in the first half of the century explained the successful manipulation in a nutshell, "Crowds are led by symbols and phrases... success in dealing with crowds...rests upon the art of getting believed in. We know that Henry the Eighth by his obsequious deference to forms of law was able to get the people to believe in him so completely that he was able to do almost anything with them." 4. In 1934 Lee was sent to Germany, assigned to design a positive public image for the Third Reich. He was subsequently called to account by the Special House Committee of UN-American Activities. Paul Weyrich and his Heritage affiliates, whether students of Lee's or not, apparently have attained mastery of the symbols and phrases of their target group--traditional Christians. Reclaiming the Culture has been the dominant theme of recent Heritage affiliated conservative organizations. Their outcry against evolution, abortion, and the political correctness brings fervent support from the masses. This certainly sounds like patriotic pro-family All-Americanism. Many stirring speeches have been made at Heritage sponsored fundraisers. Yet, the decidedly socialistic and unconstitutional concept of federal block grants to states is also touted as All-American. Weyrich & Co. supported NAFTA and GATT, two agreements that must be in place for Big Big Business and will, in time, destroy the economic stability of American families forever. Pro-Family? The founding fathers of this nation did not advocate the pursuit of any agenda that disregards the Constitution. A global economy existed 200 years ago. Tea came from Asia then, as it does now. The founding fathers did not advocate a redistribution of wealth to promote a global economy and I believe they would have scorned the Heritage "level playing field" sales pitch for the hollow come-on it is. Another Weyrich organization, The American Legislative Exchange Council, writes and disseminates "sample" legislation. In 1994 the self-proclaimed conservative pro-family American Legislative Exchange Council chose to honor one of the most radically anti-family socialist education reform plans in the nation, " Because of the state plan's scope and high standards, the American Legislative Exchange Council last month chose Oregon as one of eight states to receive its A+ award in education." 5. This explains the resounding silence of the Heritage Foundation and it's affiliates in denouncing the National Center of Education and the Economy headed by Workforce designer Marc Tucker and his Carnegie cohort David Hornbeck. In addition to the usually targeted liberal board members, Hilary Clinton and Ira Magaziner, this NASDC funded design team included David Rockefeller, Jr. Heritage is obviously not about to bite the hand that feeds it. The above cited A+ award to the state of Oregon, pilot of Tucker's Certificate of Mastery plan, suggests that Weyrich, through the American Legislative Exchange Council is paying homage to the Rockefeller interest in Marc Tucker's Design Team. Vera Katz of Oregon is also on the NCEE board of Directors. At the height of the Vietnam war David Rockefeller's Chase Manhattan Bank accepted a Soviet invitation to open a representative bank in Moscow. "(The official address of the Moscow branch, somewhat incongruously, was 1 Karl Marx Square and it was located 1 block from the Kremlin)." 6. A footnote on page 426 of this same book amplifies that, "After the 1968 elections, the Russians let it be known through diplomatic channels that chances for rapprochement would be dramatically increased if David were ambassador." Top men of the Heritage Foundation, Weyrich and his second in command, Ed Feulner, with the trust and cooperation of masses of sincerely committed conservatives have been in a position to further elitist Rockefeller goals. Along with radical World Government advocate, Walter Hoffman of the World Federalist Association, they participated on the 16 member U.S. Commission on Improving the Effectiveness of the United Nations. You can request a copy of their final report by contacting the Commission at 1825 Connecticut Ave. NW, Washington D.C. 20009. (Phone: 202-673-5012. Fax: 202-673-5007). Working with the US Information Agency, Feulner also participated in facilitating the infamous 1985 US-Soviet Education Technology and Cultural Exchange Agreement. Soviet pedagogy, based on behavioral conditioning for a compliant collective labor force, is a dream come true for the dozens of multinational corporations funding all the think tanks promoting American education reform. The humanist Carnegie Foundation, a century-long collaborator with Rockefeller philanthropy, facilitated the Soviet side of this Exchange Agreement. Americans AND Russians, we are all targets to be restructured / perestroika'd. Remember Gaither's assertion to Dodd... the merger of the United States multi-national corporations' version of "free enterprise" married to the Soviet-perfected collectivist workforce, described in 1953 is nearly complete. Will it be complete by the year 2000? Could there possibly be a new global entity managed by a "reinvented" United Nations? With a state by state interlock of affiliates having a media-hyped public persona of Judeo-Christian morality, Heritage Foundation affiliates have skillfully marketed the specific facets of the socialist agenda of Rockefeller's International Bureau of Education-UNESCO agenda for education ie. Character Education and Choice/Vouchers or Charter Schools. Character Education was primary to humanist John Dewey's input into the Bolshevik school system and was the heart of Chairman Mao's Cultural Revolution in Red China in the 1960s. Both of these systems are designed to condition compliance for the benefit of the collective's Workforce. UNESCO foresees an actual character evolution within the human species in coming generations where mankind will evolve into Homo Moralis. Heritage/Hudson/Empower America insider, Dr. William J. Bennett's bestseller, THE BOOK OF VIRTUES correlates as the New Right counterpart of Chairman Mao's Little Red Book. The 1955 UNESCO book, MENTAL HEALTH IN EDUCATION, is the earliest reference for the need for "choice" in education. Choice, vouchers and Charter Schools are part of the octopus approach. It radically changes school governance and finance, diminishes local control and fulfills the "all children will...." mandate of the UNESCO inspired national goals. The Charter Schools concept, strongly marketed around the country by Heritage affiliates, attempts to link patriotic free enterprise themes to a blatantly un-constitutional system of corporate fascism business /governmental partnerships in the education of children. Wall Street is currently gearing up for a brand new field of investment---for-profit public education. Convicted junk bond dealer, Michael Miliken, has expressed enthusiasm for this new trend, "He told the Wall Street Journal on Friday that he's trying to build his own education company. 'If we are successful, I really believe you can have a $50 billion to $100 billion company in the field of education." 7. As Americans we have a right and an obligation to political action, but Christians have a higher obligation. We must not join questionable coalitions or jump on any passing bandwagon that plays a catchy tune. Our home is not in this world, or of this world. Reclaiming the Culture is not a new agenda. Indeed, there were many Israelites fighting to "Reclaim the Culture" when Jesus Christ walked the pavements of Jerusalem. They were not followers of our Lord Jesus. They wanted no part of Him or his plan of salvation. They were followers of men like Eleazar the Zealot who ultimately led his people to their fatal end on the ramparts of Masada nearly 2000 years ago. Make your stand for what is right, but be very careful of man's institutions, be wary of coalitions, examine the money-trail. . . for whoever pays the piper calls the tune, the tune the whole world will dance to in the 21st Century. "...If we are going to be a serious nation, we need a serious system for selecting our leaders and advisors, we need some sort of shadow government, in which leaders and top advisors can be developed, and through which our politics can be better focused on policy choices. The world is a professional league, and we cannot win fielding amateur teams." 1. Peter Collier and David Horowitz, The Rockefellers: An American Dynasty, 1976. 3. William Greider, Who Will Tell The People: The Betrayal Of American Democracy, 1992, p. 28. 4. The Rockefellers: An American Dynasty p. 115. 6. The Rockefellers: an American Dynasty, pg. 427.